This is the final part of a two part interview with Janice Bissex and Liz Weiss, otherwise known as The Meal Makeover Moms. Be sure to start reading with part 1. In this part, the moms share some tricks on getting kids to eat healthful food. Kids liked the bell pepper in these confetti chicken wraps better when it was cut in little pieces. What makes the recipes kid-friendly? Janice: Familiarity (kids tend to like things that they’ve seen before) and flavor (something that tastes good). We’re not afraid to use a little bit of salt or a little bit of sugar to make things a little sweet or a little salty (just to pump up the taste), but we keep it in that healthy zone. Also, we add textures. Here’s a classic example: One of the recipes in our book, The Moms’ Guide To Meal Makeovers, is confetti chicken wraps. We sauté up an orange bell pepper and then we add the chicken and the beans and the cheese and the salsa and the seasoning and we put it into a wrap. When we first made the chicken wraps, the bell pepper was sliced into thin strips and sautéed. That grossed the kids out, so the second time around, when we continued our makeover, we chopped up that bell pepper into small, little pieces and we sautéed the bell pepper. It blended in much better with the cheesy, gooey filling. 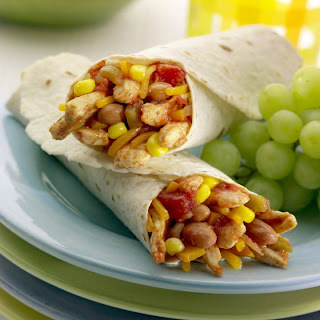 This is a makeover of the fast food chicken burrito and, because we altered the texture just a little bit, we took out the “yuck factor” and we made it kid-friendly. Do you have a panel of kid testers? Janice: Oh, yes. I have two daughters and Liz has two sons. We also have a lot of neighborhood children who act as our taste testers. When the kids get off the bus, I often say, “You want to come over for a couple of minutes? I have some new recipes I need you to try.” If the kids all say, “Eww, yuck, we don’t like this,” then we go back to the drawing board, or the stove, and we try again. Liz: I have four girls who live next door to me, so when we were testing recipes for the book (and now we have a weekly radio podcast called Cooking With the Moms), I ran next door. My boys, obviously, are the front line. They are the first panel members. We always want to make sure. We know we’re not going to get 100% because somebody might hate peas, so forget it, there’s no hope. But, in general, we’ll distribute our recipe around and make sure kids like it. Do you find that there are some recipes that go over better with different age groups? Janice: I think so. Caroline, she’s the 16 year old, is a little bit more adventurous and might try more things than the 8 year old would. I think overall our recipes are really geared for the whole age spectrum of kids. Liz: And I also think, for my boys, Simon is probably a little more open-minded than Josh, the younger one. I think when you become a teenager, you become a little defiant and more independent. So, for him it’s a, “I’m not going to eat that. I’m mad at Mom today,” kind of thing. Janice: My daughter’s never mad at me. 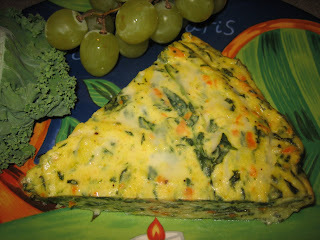 Liz played a psychologist to get her son to try the tofu spinach pie. Liz: We made tofu spinach pie. A friend of mine had sent me a recipe and it required a makeover so it was healthy - it was bland and boring and there was too much spinach in this tofu spinach pie. It grossed her kids out. So, we gave the recipe a makeover and we made it much more kid-friendly. My son, Simon, and his friend ate it like there was no tomorrow and when I asked Josh to try it, he looked at it and said, “I’m not trying that.” I said, “Josh, come on, buddy.” Of course, he ate the entire thing and loved it. So, it’s just a matter of playing a little bit of psychologist once in a while with the kids. Janice and I have been talking about it, and we have a lot of strategies for getting the picky eaters to take that first bite. When they do, quite often, you have them hooked. It’s really just that first bite. Tell me about that. What are some strategies? Janice: One strategy that we implemented was that we developed a recipe reviewer chart. We ask our children to be recipe tasters and we say, “Okay, here’s the new recipe. Here’s the little chart on a piece of paper.” There are three columns: a smiley face, a neutral face, and a sad face. Then, the child gets to taste the food and then check off their opinion of it. Now they feel like they are big shot tasters, and you can reward them. After 5 or 10 tastes or reviews of a new food, they get a prize. Liz: You can pay them if you want to, like a quarter, and you can fill up a jar. It really depends on how old your child is. This is a great strategy. I think it’s worked best for Leah, she’s the youngest among the four kids, and she’s probably the most finicky among the four. She does love to try stuff because she knows it’s for the book or the podcast or the blog, but it just gives them that little empowerment. We’re redoing our website in a few weeks, and that tasting chart will be on there for free. People can download it and print it off. That’s one way to get picky eaters to try new foods. Another is blindfolded taste testing. I’ve done it with my two boys and two of their buddies, where you sit them around the kitchen table and you blindfold them. It’s really a fun game. You do one item versus another. The one time we did this, it was for whole grains. It was right after the USDA came out with their new dietary guidelines and whole grains were all the rage. Let’s face it, kids essentially don’t eat enough whole grains. Everybody from Goldfish crackers to Fig Newtons to Pepperidge Farms little mini-bagels was coming out with a whole wheat version. So, we did the before/after. We’d have them taste the white bagel and the whole wheat bagel, “Which did you like better?” and we would make them raise their hands. Now, they’re blindfolded, so there was no peer pressure. Josh, my 13 year old, at the time was 11. His friend, Eric, was over. It’s a fun way to get rid of peer pressure, but then again you have the peers support one another: “Oh my gosh, Eric, you like the whole wheat the best.” It’s just fun and it takes the heat off everybody and you become more playful with the whole nutrition thing and you get them to buy into good nutrition. We’re not about sneaking or deceiving. We’re about getting kids to want to eat the good stuff. Janice: In our first book, we had a strategy called the “No Thank You Bite.” That is also pretty effective with younger kids. You say, “You just need to take one bite of a food and then you have the power to say, ‘No, thank you, I don’t want to eat anymore,' or, 'I’d like some more please. '” They just need that one bite and then they have the power. They can control that. They can say that they don’t want to eat any more and you have to be okay with that. When you make these changes in your home, does it affect the choices your kids make when they are outside of your home? Janice: ...he grabs all the candy. Liz: He does not eat a healthy diet. However, he does feel bad, physically, if he doesn’t eat well. I’ll say, “Ya know, remember those salads you love.” He’s a huge salad eater. I think he has the knowledge. He went to the beach with a friend last night and they ate beach food. I was like, “What did you have?” The first thing he said to me was, “Oh we had fruit. There were some watermelon slices up there at the beach.” So, he’s aware of it. I think once you lay the groundwork, even though they may have a few defiant years, they’ll go back to it, because they like it. They like the way the good stuff tastes and they physically feel better. I do remind him. I say, “You’re very active now. But boy when you get older, you’re not going to be able to eat that three foot long candy bar. You know, its just not going to be a good thing, buddy.” You think I’m joking, but I’m really not. What about your kids, Janice? Janice: Well, I do think they, for the most part, eat a pretty healthy diet. You know, I find some candy wrappers when they go out and they have some candy. But that’s okay. We both agree. In our first book, again, we have what I call the 90-10 rule: if you eat healthy about 90% of the time, there’s room for treats, there’s room for a root beer float, or a piece of candy, or a lollipop, or whatever it may be that the kids want as a special treat. It’s okay because they’ve had some whole grains, they’ve had some vegetables and fruit, and you’ve packed some sliced up watermelon or pineapple cubes in their lunch, and some baby carrots with ranch dressing. You can feel good that they’ve had the basics of their diet. Again, you can fit in some of these, what we call not-so-healthy foods, once in a while. Liz: And the other thing we do, we offer our kids treats. We just happen to make them a lot healthier, and here’s one example: this week, the theme of our radio podcast is going to be frozen treats, and we have a sundae makeover. We make an ice cream sundae, but what we do is use low fat frozen yogurt (to me it tastes just like ice cream) and we get a reasonable portion - we do a scoop (it’s a third of a cup). Then, surrounding the scoop, we have strawberries that we’ve sliced up, and we top it with some chopped toasted pecans. Then, we drizzle caramel syrup and chocolate syrup over the sundae. Even though you’re drizzling it, when you drizzle, you don’t really end up with a lot of syrup. It's enough where it's covering the berries and the frozen yogurt, and every single bite is like, “Wow!” You’re getting all those flavors - the strawberries, the nuts, the cold frozen yogurt, and the caramel. I have to tell you, they’re getting calcium, they’re getting the vitamin C from the strawberries, they’re getting the good nutrients, the good healthy fats from the pecans. That’s not a disaster. It’s a small, kid-friendly sized sundae. It’s a big treat. But, it also has a lot of good nutrition woven in. With more and more dads in the kitchen these days, do you find that you have men that follow you as well? Janice: Oh yes, we do. We get email. Greg, from Minnesota, emails us a lot. I think it’s still more women and moms that email us, but we certainly know of a subsection of our fan base that is dads. I know a lot of dads who use our book. Our book is geared towards people who don’t have a high level of culinary knowledge. Our recipes are pretty straightforward. They use everyday items and so I think that that’s something that also appeals to dads who may not be as comfortable in the kitchen. What about couples without children and singles? Can they use your book? Janice: Oh yeah. I mean, my parents, their kids are all gone. I have a sister who does not have children who cooks out of our book all the time. She is always emailing me saying, "I tried this recipe. It was great. What should I make for my party on Saturday night? What do you recommend?" It’s a gift that I’ve given to my nieces when they graduate from high school, when they go off to college, and do cooking, and have their own apartment. It’s a good resource for them as well. If you could get Americans to just make one change to their diet, what would it be? Liz: I would say eat more fruits and vegetables. Janice: I would definitely say that. The whole grain thing is really big, too. It’s been shown that people just don’t eat enough whole grains and there are so many great nutrients in whole grains - vitamin E and magnesium and all that important stuff - just eating real food. Liz: It’s all this processed, packaged stuff that’s killing people - the soft drinks, the juice drinks (which are really not juice), the bags of finely refined starchy, nutritionally dead snack foods that provide no nutrients whatsoever. Eat real food and enjoy. Janice: Enjoy your food. Sit down and enjoy your food. Eat when you’re hungry; stop when you’re full. What a novel concept! You’re not a three meal a day person? Janice: Oh gosh, no. I probably eat 6 meals a day. Liz: A lot of snacking in between meals. Half time Taco Chili is a staple in Janice's home. She sends her kids to school with it. Janice: That’s a good question. Liz: I would say the one I make the most, probably, is our banana chocolate chip muffins. I have that at home right now. It’s a great snack food. It’s a great little treat. Janice: I would have to say the Halftime Taco Chili is my family’s favorite. I made it pretty much every Sunday last winter. If there’s a football game, a Patriots game, and we have friends over, it’s a good recipe for a crowd. My girls love it. It’s a great chili recipe. Janice: Oh, its got the lean ground beef, a couple of carrots that are shredded up, and its got an onion, crushed tomatoes, black-eyed peas or pinto beans, and its got the hominy (you can use corn if you can’t find hominy, but its really kind of fun with the hominy). Just some spices, chili spices, cumin, a little garlic powder, then you sprinkle some reduced-fat shredded cheddar cheese on the top when you serve it, or a little sour cream for Leah (she’s the sour cream queen). Nobody that I’ve served this to hasn’t raved about this. Honestly, I love it too. I have leftovers for lunch the next day. 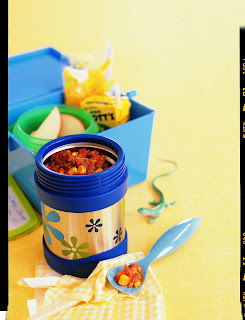 Don’t dump it into the lunchbox, put it into a thermos first. Janice loves history and highly recommends The Big Oyster. Janice: I would interview Julia Child. That would be kind of hard. I’m just finishing reading her book, My Life in France, and I’ve met her several times. I just think she’s just such a passionate woman and I really would enjoy sitting down and interviewing her. Liz: I think there’s no one person I would interview, but I would love to interview somebody who came to this country in the 1600’s, literally, because I want to know what it was like when you walked on the shore and looked in the water and saw all that life and looked up in the sky and looked around you: what on earth was it like? I just think that would be amazing. 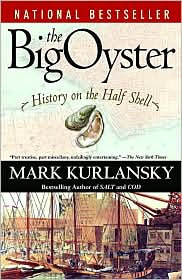 The reason I say it now (maybe I’ll change my mind next week) is that I’m just finishing up this Mark Kurlansky book, The Big Oyster, which is just fascinating. It’s all about New York and the oystering spree and the Dutch settling the region. I’d heard him on the radio on NPR with Chris Schlesinger (a big chef in the Boston area), and I was just like, "Oh my gosh. I have got to read that book." For a year, I’ve wanted to read it, and I finally did. I would highly recommend it. I’ve always been into history and how food has evolved over the years. It would be so cool to go back in time and talk to one of those people. Janice: Of course, neither of us could actually do these interviews. Everyone’s dead. It sounds like these recipes would be great for everyone, not just moms - I'd love to try some of them on my husband (and myself)! It's great to see a cookbook that doesn't just make kids food cute, but also healthy. loved the second part too--I'm curious how do you get past the sensory issues with food texgtures and getting toddlers to try them? I love the idea of a "no thank you bite" since it gives the kids a sense of control -- and they may discover they actually LIKE what they say they don't want. I'll be implementing that in my house. Thanks for a great interview! Getting past the sensory issues with food textures with toddlers can be a challenge. We recommend that you offer a variety of tastes and textures and see what your toddler will accept. They can be finicky but if you are patient and don't make a huge deal about what your child eats (easier said than done!) eventually they will learn to enjoy many foods. Janice's daughter loves raw cauliflower and won't touch it cooked. Some kids love frozen peas but not cooked peas. Some like things crunchy, others mushy. It's a matter of experimentation, and again, patience. Good luck and let us know if you have further questions. Oh, confetti chicken wraps. These look good! Great strategies for getting children to try new foods. I love the blindfold idea!